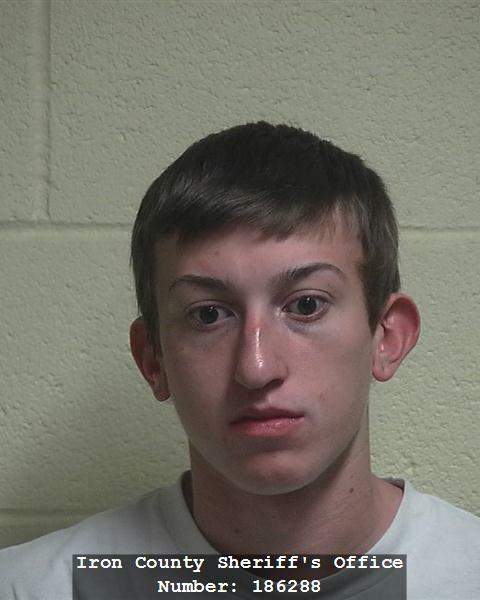 CEDAR CITY — A 19-year-old Cedar City man was arrested Wednesday in connection with approximately 19 vehicle burglaries after being on the run since October. Between Aug. 15 and Oct. 18, over 40 vehicle burglaries were under investigation throughout the Cedar City area, Cedar City Police Officer Kyle Liddiard wrote in a probable cause statement supporting the arrest. Of those burglaries, police recovered stolen property, witness statements, and forensic evidence directly linking 19-year-old Reagan Matthew Gurbal to 19 specific burglaries. Gurbal was not the only one involved in the burglaries and is believed to have worked with multiple juvenile accomplices, Liddiard said in the statement. The items targeted by the group were electronics, charging cords, GPS units, money, jewelry and firearms. “It was common practice to meet back at Gurbal’s residence after splitting up to do vehicle burglaries and split up the stolen property from the night,” Liddiard said in the statement. On Oct. 18, Gurbal fled from the Cedar City area — along with four juveniles — to Southern California in a vehicle one of the juveniles had taken from her parents, Sgt. Jimmy Roden of the Cedar City Police Department said. Once in California, the group was allegedly involved in several other vehicle burglaries before being apprehended by California’s San Bernardino Sheriff’s Office. Because he was the only legal adult, Gurbal was released from custody in California, while the juveniles remained in custody, Roden said. The juveniles were eventually picked up by Cedar City law enforcement after their location was determined. Since that time, there has been an ongoing search for Gurbal, Liddiard said in the statement. “He has, in fact, contacted the Cedar City Police Department and refused to cooperate or tell of his whereabouts,” Liddiard said in the statement. Cedar City police eventually located Gurbal on Wednesday when they responded to the scene of another vehicle burglary, Liddiard said in the statement. Gurbal is believed to have been involved in this burglary as well, Liddiard said, and was arrested on scene. During an interview with police, Gurbal admitted to being involved in 20-25 vehicle burglaries in a single night, Liddiard said in the statement. During the course of these burglaries, at least two handguns were stolen. These firearms were ultimately recovered with Gurbal in California when he was detained, Liddiard said in the statement. The verified stolen property at Gurbal’s residence is valued in excess of $1,500, Liddiard said. Vehicle burglaries such as these can be easy prevented by people taking simple steps, Roden said. People are urged to consider implementing those simple steps in their daily life. Another tip is to remove or hide any and all valuables inside the vehicle, Roden said. If they must be left in the vehicle, placing them inside a console, glove box or the trunk is recommended so they remain out of sight. Gurbal was booked into the Iron County Jail with his bail for release set at $7,500 cash only. He is charged with two second-degree felony counts of theft of a firearm, one third-degree felony county of receiving stolen property, 19 class A misdemeanor counts of burglary of a vehicle and four class B misdemeanor counts of contributing to the delinquency of a minor. According to the 5th District Court docket, Gurbal is scheduled to make his first appearance on Monday. Persons arrested or charged are presumed innocent until found guilty in a court of law or as otherwise decided by a trier-of-fact. Juveniles involved in this incident as victims, accused, witnesses or otherwise are not named in light of privacy considerations. Cedar is turning into one big ghetto “hood”. “Turning” into a big ghetto? Gurbals are used to being in cages. Just feed him and water him and he’ll be happy! A nice long stay is what he needs! He really does look like a dumb gurbal doesn’t he, with that mindless blank look. I wonder how he escaped his cage in the first place. Gurbals aren’t known to be too bright, but keep them watered and fed and they are an easy rodent to keep happy. Well, just by looking at this jerk’s picture, I’d say he is ripe to be the “girlfriend” of whatever jail tank they put him into. Hope he enjoys it, he has earned it. LATEFORWORK, You have to give some ignorant, judgmental folks some leeway. It’s standard practice for some, to look down and point fingers without looking in the mirror first. Clean up their act you say? Why, that takes way too much effort and time. Besides, there are more news articles to read, more road apples to prepare & throw. And besides, I can’t find my false teeth anywhere. Yes, I’m looking in the mirror as I type. ‘Mirror Mirror on the wall’, who’s the fairest of them all? ME? really? I don’t much care for doping, dirt bag thieves. If you two have a problem with that, then it is your problem.